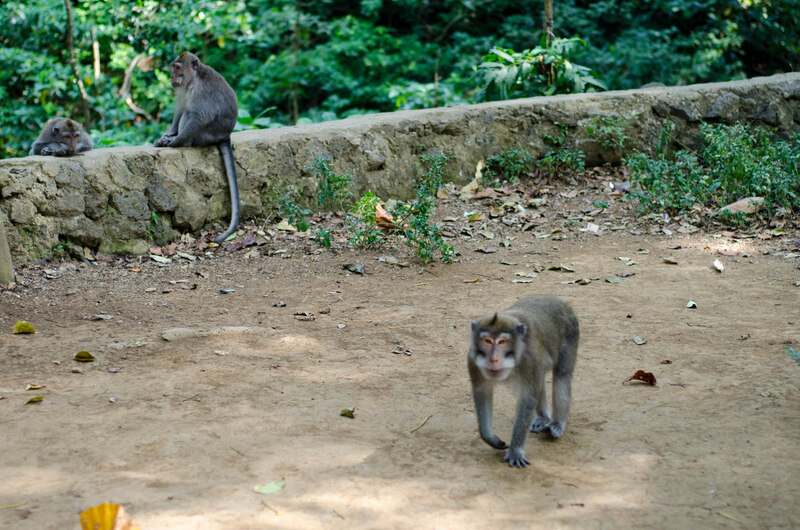 Josh and I had initially been skeptical of the Monkey Forest, as we’d heard a lot of horror stories about the mischievous residents of the forest and weren’t sure if we wanted to deal with their bad behavior. Nonetheless, Monkey Forest seemed to be an essential Bali experience, so we hid our water bottles, secured our bags, and crossed our fingers that we wouldn’t encounter any thieves. As it turned out, the monkeys were just as naughty as we’d expected, but that ended up being half the fun. 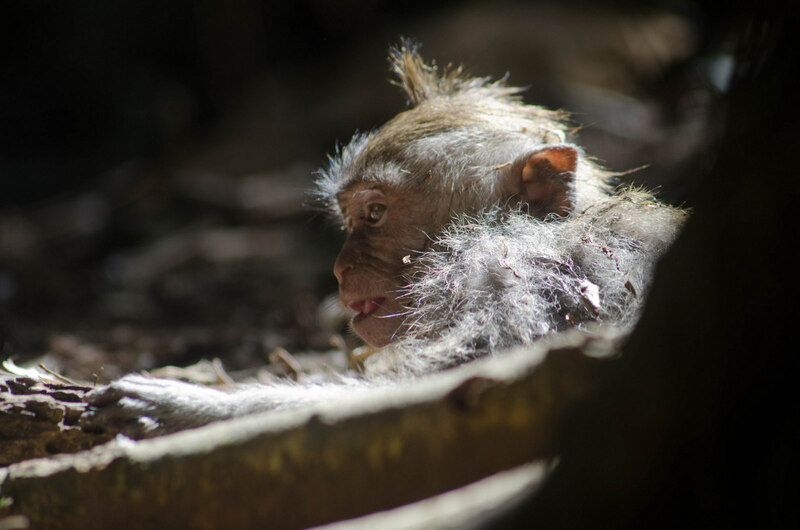 We watched the monkeys climb on top of people, and we witnessed several attempted burglaries (and a few successful ones) when some of the primates saw–or smelled–something shiny or edible and tried to take it for themselves. The misbehaving monkeys were really funny to watch, but I was equally fascinated by some of the gentler interactions among the monkeys. I sat down to rest, and some families came over to join me. A mother sat next to me and suckled her newborn as her other children performed acrobatic feats, seemingly for my entertainment. The monkeys were not afraid of humans at all, and at times they seemed just as interested in us as we did in them. Yet at other times, they went about their business without any acknowledgement that they knew they were being observed. As for the forest itself, I was surprised at how nice it was, with minimal litter, and it was big enough to spend about an hour wandering around in. We first went uphill to the main temple, where we saw some monkeys in the form of statues and reliefs on the temple exterior. Our next stop was the holy spring temple, which was teeming with activity. Some monkeys basked in the sun and groomed each other while others cracked open coconuts and snacked by the stream, where other monkeys were splashing around in the water. The final temple we stopped at in Monkey Forest was the cremation temple, near the exit. Josh and I took obligatory photos with two monkeys who were basking on a ledge above a waterfall, which made a perfectly placed rainbow. It wasn’t until the end of our visit that we encountered a terrifying monkey who bared his teeth at Josh and Molly and approached us, growling. Luckily, he lost interest in stalking us after we backed away far enough. 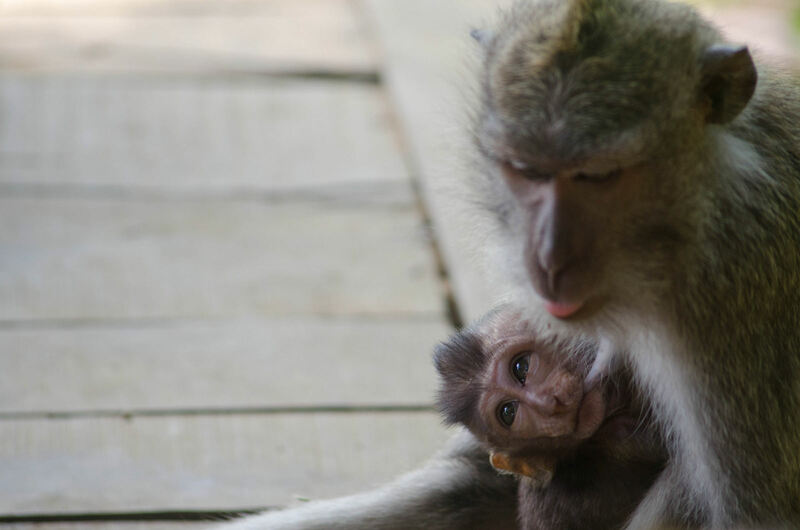 We also witnessed a monkey biting a child who was trying to play with it, so it’s important to bear in mind that the monkeys aren’t just playthings for the visitors. 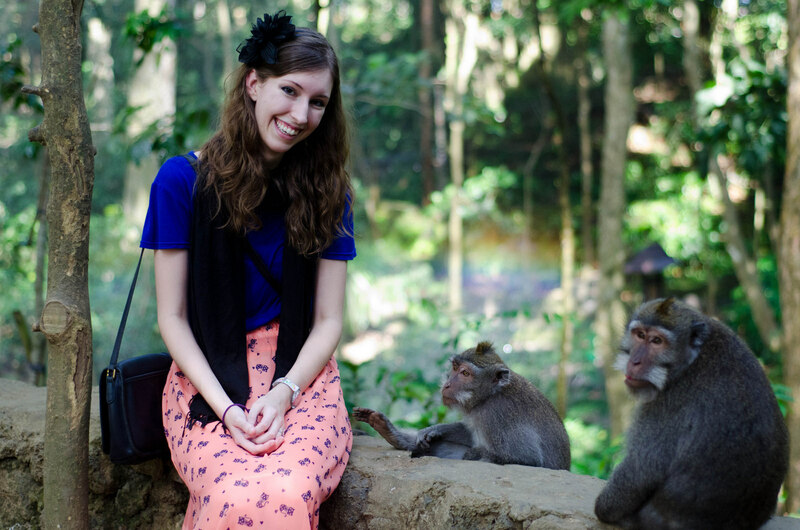 I loved spending an afternoon observing the monkeys, but it’s important to follow a few guidelines when visiting Monkey Forest. Don’t bring food. Even if you hide it in your bag, the monkeys will smell it, which means one of two things. Either they will break into your bag and take the food, or they will attack you until you give it to them. Don’t feed the monkeys. The signs at the entrance of Monkey Forest ask you not to feed the monkeys, but there are vendors who will gladly sell you a bunch of bananas as you enter the forest. 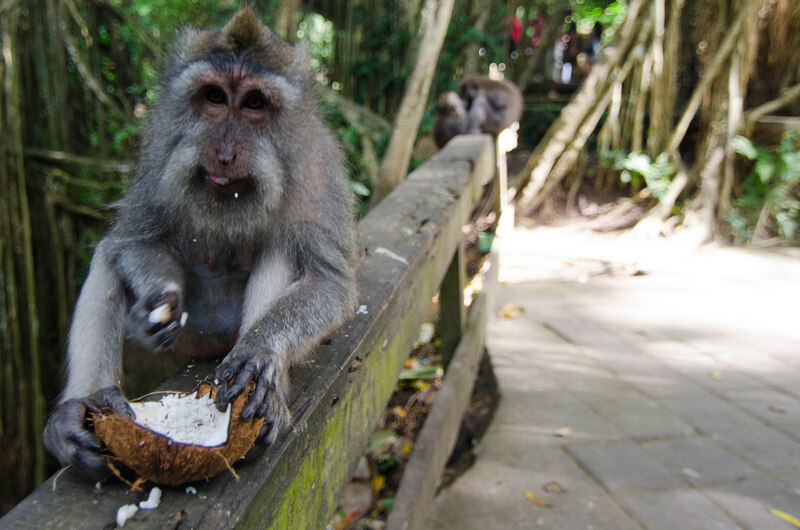 Sadly, many of the monkeys are obese, and you’re not doing them a favor by overfeeding them. It is also likely that as soon as you buy the bananas, you’ll be bombarded by the greedier monkeys who will attack you if you don’t give all your bananas to them immediately. Don’t litter. 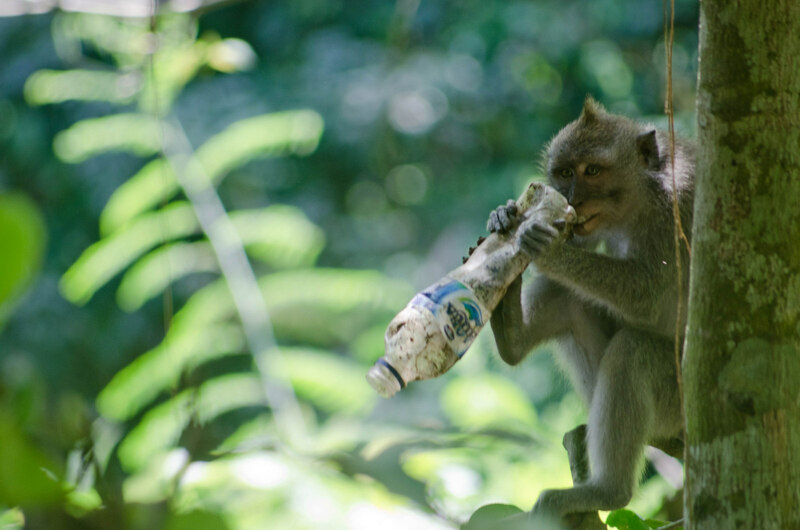 This should go without saying, but sadly we saw many monkeys nibbling on discarded pieces of trash and it’s an unfortunate truth that in Indonesia, it’s simply expected that you throw your garbage directly on the ground. Secure your belongings. The monkeys are clever and will often work together together to steal your things. Hold on to your glasses, hats, and jewelry, and make sure your bag is impenetrable and your pockets are empty. Respect the monkeys. Another one that should go without saying, but you are there to observe some amazing creatures in their own homes. 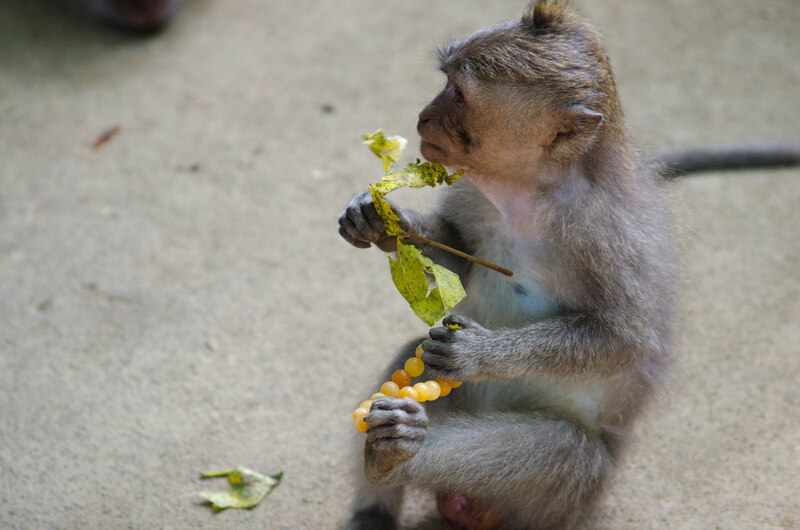 Avoid doing anything that could agitate the monkeys, and don’t touch them–not only is that invasive but it could also pose a health risk to you. Remember that they are wild creatures and if they feel threatened, they won’t hesitate to attack. 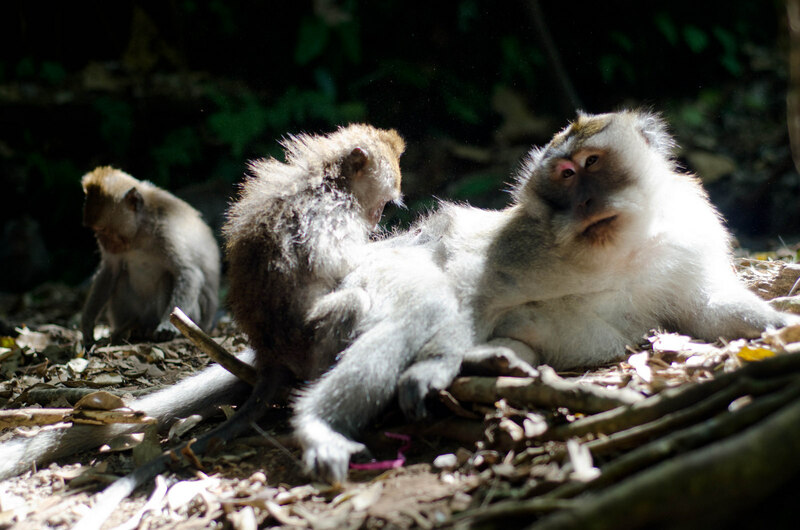 If you find yourself in Bali, I really do recommend making some time for Monkey Forest. Just make sure you’re being smart about how you behave around the monkeys. With any luck, your visit will go as smoothly as mine did! 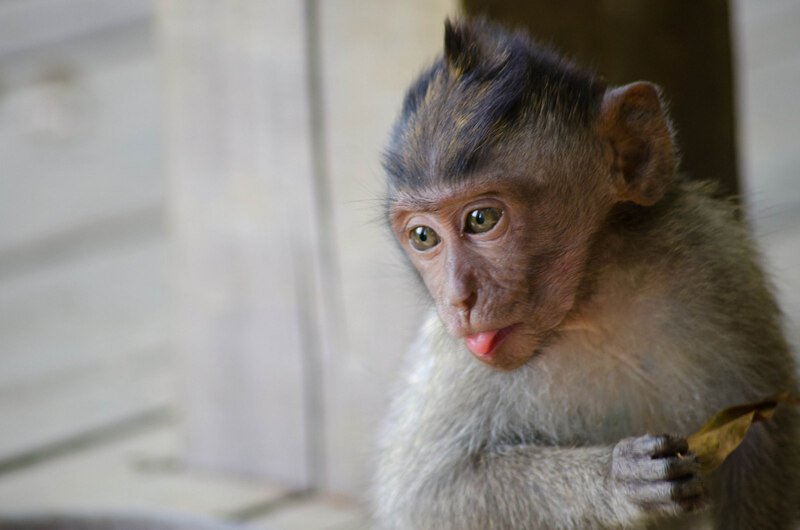 Have you ever encountered any wild monkeys? 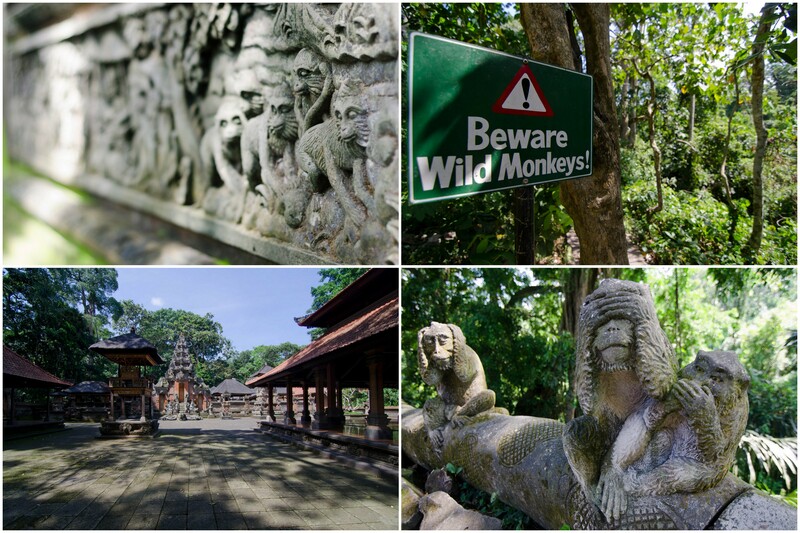 Would you visit Monkey Forest? You are truly seeing everything over there, we are very happy for you two! Hope you’re feeling much better…Thank you for sharing your adventure with the monkeys!